Just to do something a little different for this week’s Flash Back Friday I wanted to play and review a an old game I’ve never played before. Because today the latest installment in The Legend of Zelda franchise debuts to the world, I decided to review The Legend of Zelda the Wind Waker. This game was released twice once in 2002 on the Gamecube and then again in 2013 on the Wii U. Overall the games are exactly the same according to most guides, but there are some minor differences to some item/heart container locations. Anyways on to my review! The Legend of Zelda the Wind Waker begins with a telling of a story through text and pictures resembling an ancient cave/parchment drawing. The story tells of the hero of time who came to fight against evil and darkness. Then after saving the kingdom the hero disappeared and did not return when evil did. The story doesn’t explain what has happened to the people of this far off kingdom, but in certain islands this hero of time is still honored by having young men dress in his garb to inspire courage and strength during their coming of age. After a chance encounter with pirates and a giant owl, Link’s little sister is kidnapped by that giant glowing bird. When you go to try and save her that pesky owl throws you into the ocean. When he wakes up he’s been saved by a talking boat, and beginning the real adventure sailing the seas in order to save the ones he loves. Through the adventure’s trials Link discovers that he is a reincarnation (of sorts) of the Hero of Time and he has been tasked with saving what remains of the Hyrulian Kingdom. Now that we’ve gotten through the basic premise of this installment in the Legend of Zelda franchise let’s get to the nitty and gritty of this review. The concept of traveling from island to island across the expanses of Hyrule was really fun! Managing and changing this winds to push you across the expansive seas as you explore. This fantastic feeling on the seas lasts for a couple of hours initially, but by the end of the game as you’re sailing back and forth it became arduous and a little annoying, especially because the final quest feels like running quick errands to a bunch of different places all far apart form each other….. too much like real life…. ugh. While I loved the concept the execution left a bit to be desired. Bigger islands would have been much better. Legend of Zelda games are known and probably even defined by the dungeons you explore and the items you find in them. In Wind Waker both of these elements were present. The items and their uses were absolutely awesome I especially loved how some of them were incorporated into sea travel. However, in the dungeon department Wind Waker was lacking. By the end of the game there were only 5 dungeons, 4 full dungeons and 1 for Gannon’s Tower, (6 if you counted the Forsaken Fortress). This was a little disappointing. Overall, in the 15-20 hours I played the game most of it was spent on the ocean sailing. One thing I did love about this game was the art direction. When the game first came out in 2002 I thought it looked stupid and childish which took away from the seriousness of the series series. At that point I was a dumb kid, I have since overcome this hurdle and embraced the artistic decision. I actually loved some of the character design elements my favorite by far was the Knights and their peel away armor, and if the were disarmed they resorted to kung-fu/Karate. While the setting of a flooded and destroyed Hyrule was depressing the art direction and animation was still bright and hopeful in what should have been a dire situation. Also with a silent protagonist who never speaks words in text had very animated facial features all captured perfectly in this style they seemed more dramatic than all the previous titles I’ve played. My favorite expression being Link’s grunting face when he’s trying to push through wind while wearing the iron boots. The game play, as always with all Legend of Zelda titles, was fantastic for Wind Waker. The controls felt a little counter intuitive only when I was trying to aim the reflection of my mirror shield. I feel a lot of that has to do with the game being designed for the Gamecube, Nintendo’s first dual analog controller, but it made the fights with enemies susceptible to sunlight a little more challenging then they should have been, but challenging is ok. 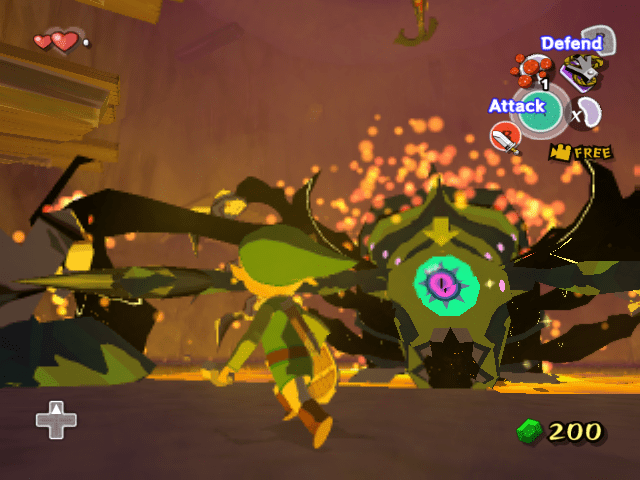 The story for wind waker is probably its strongest feature. I loved the the setting, the narrative, the character development, and story arcs. While some of the plot points and major reveals were predictable that didn’t make them bad just made it parallel to many LoZ adventure stories. The one major misstep was the Battle with Gannon….. it was pretty bad. In many other titles it is quite the epic showdown this wasn’t the case so much. I hated the puppet and its iterations. However the final showdown with Gannondorf was incredibly epic. I loved every second of that, and the ending of that battle was actually unexpected. I think my jaw actually hit the floor. While this probably will never be my favorite Legend of Zelda game, I was super glad that I played through it, and I would recommend to anyone who hasn’t played it yet to do so. What did you think of The Legend of Zelda the Wind Waker? Which one is your favorite? Let us know in the comments below! I’m glad you mentioned how stupid the puppet Ganon was haha that fight is so frustrating and weird!! I personally don’t understand how you could rate the gameplay with a B though… sure the sailing gets tedious but if you get the Swift Sail it really isn’t that bad. Especially if you use that along with the fast traveling, courtesy of Cyclos! And I think that although there aren’t a ton of dungeons in this game, the ones that they have are very well made. I especially love the dungeons where you bring sidekicks, they are so much fun! I also think the replay value needs some more credit. I may be biased because I just love this game so much, but I think the replay value here is actually surprisingly high for a Zelda game, especially with the WiiU version. There is so much time that can be spent going back through the game with the Pictographs, getting pictures of every person and every enemy to get their sculptures made. You can always try to find every heart container, and every Great Fairy, and explore some more of the extra areas in the different islands. Considering the game originally came out on Gamecube, the vast ocean is actually fairly impressive and allows for lots of extra gameplay after the story is done, and even as a second run (as you can only collect every statue if you do at least 2 runs). All great points Allie… this is a great game! I think in my mind you have to compare it to the other Zelda titles to give it a fair replay score. I would much rather pick up Twilight Pricess or Ocarina of Time if I was going to replay a title over again. It maybe a little unfair that this is the first time im picking it up to play and grade, considering the game was built 15 years ago. The reason sea travel bugged me so much had everything to do with finding the shards of the triforce of courage at the bery end of the game. It felt silly running around the expanses of the world to stop at an island for 15 or 20 seconds to only open a chest. There was so much potential to turn those into serious levels. Much like the very first LoZ title. So in my mind they left too much on the table. When I get a chance and am not under such a tight deadline to finish for such a momentous occasion I can take more of a completionist approach to the title. I’ll let you know how that goes then.